Hi loves! I'm back today with some fun swatches. 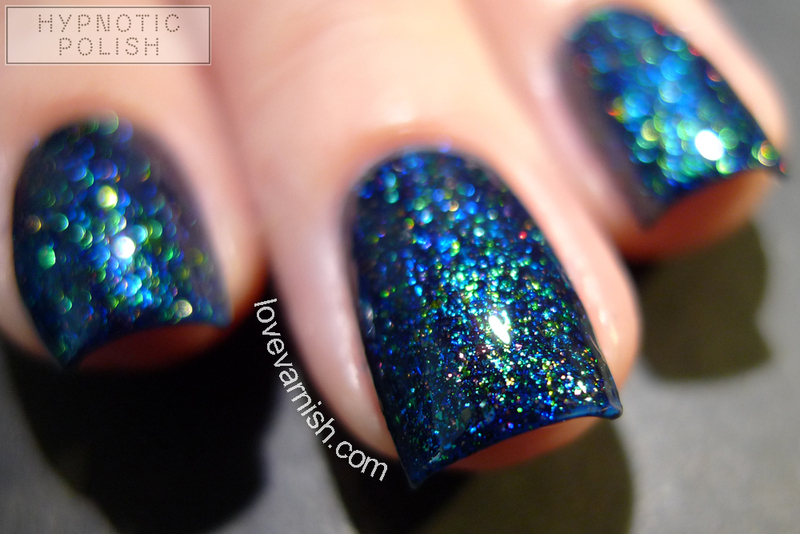 Last week I couldn't resist the restock of Dance Legend Sub-Zero and so I placed a small order at Hypnotic Polish including Emily de Molly Ariel's Realm as well. Maria was so kind to provide me with a few extra's ♥. One of the extra's is the store exclusive from Emily de Molly called Hide and Seek. I'm showing you both shades today! Do you have a napkin ready? Emily de Molly Ariel's Realm has a teal jelly base filled with green/blue/gold colour shifting flakes and copper micro holo glitter. It's everything I hoped for based on swatches and more. Really, the depth, the sparkle, the colors, I CAN'T EVEN! Under my usual set up with artificial lights it's sparkly and eyecatching, in daylight (pictures included at the end of the post) you can see the individual bits and sparkles. Breathtaking either way! The formula is on the sheer side which I don't mind - this way it builds up more of the gorgeous sparkle. I used 3 thin coats for opacity and finished with topcoat. Emily de Molly Hide and Seek has a purple base filled with strong blue shimmer. The shimmer also has a pink duochrome flash to it! Because of the purple and blue this shade was hard to capture, so I recommend looking at more swatches before deciding to purchase this if you like it. I love how much shimmer there is in this beauty. The first coat was slightly patchy but once you've got that one down a bit even, it becomes perfectly opaque and even in 2 coats. It dries to a satin finish so I used topcoat to highlight the shimmer more. While I did have some experience with Emily de Molly before, I have to admit it has been so long I treated these as a new to me brand. I like the square bottles and the brush is good as well - flat and not too wide. Both colors look very unique to me and the formula was good on both. My absolute favorite is Ariel's Realm but Hide and Seek was a great surprise as well! Have you ever tried polishes from Emily de Molly? If so, which one's your favorite? If not, did I tempt you enough with these swatches ;-)? Tell me in the comments! Hypnotic Polish is a European based indie stockist that ships internationally. Besides Emily de Molly, they also carry Smitten Polish, El Corazon, Colors by Llarowe, Dance Legend and many others.